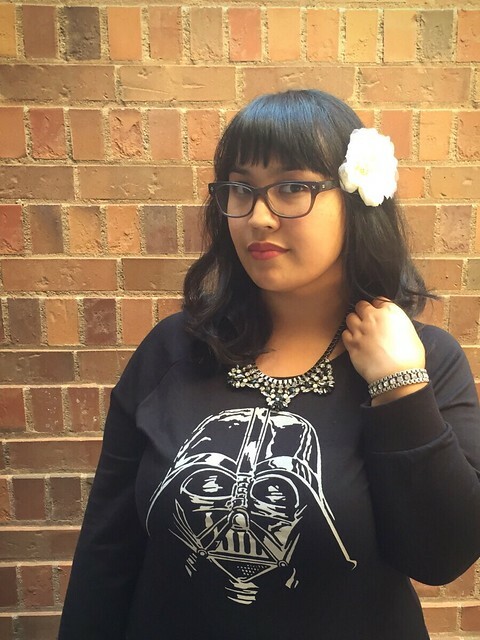 If you’re super into fancy baubles like me, you might like Rocksbox! If you’re not familiar, Rocksbox is a jewelry subscription service that loans 3 pieces of jewelry by designers such as Kendra Scott, Loren Hope, Wanderlust + Co, etc. It’s kind of like Netflix, but for jewelry! Everything comes in a fancy little box, and they conveniently include a return label for when you’re all done to ship it back. If you happen to fall in love with any of the pieces they send you, you can buy it for a discounted price too. And BTW, each box contains at least $200 worth of bling! You might be asking, “But, Nina. How do they determine what kind of jewelry you get? Do they just send random pieces, have a set design to send with every box, or whuuut?” So lemme tell you! When you sign up for Rocksbox and become a “Shine Insider,” you take a survey so they can figure what you’re into style-wise and then you get to create a wish list. 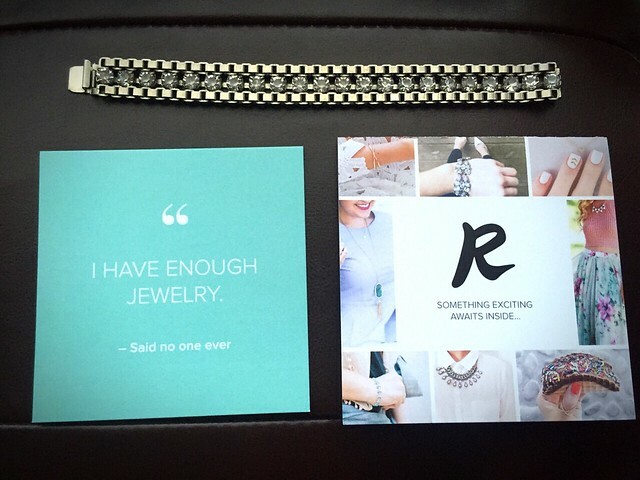 Once your wish list is created, a Rocksbox stylist will curate a box for you based on the pieces you chose and voila! 3 out of however many pieces you chose will magically appear at your doorstep! Or mailbox…. or, y’know, wherever you happen to pick up your mail. And you’re not limited to just one box a month! Once you send back the first box you get, they’ll put together another one for you once they receive it. For my first Rocksbox, I received a gunmetal bib necklace by Wanderlust + Co, a bracelet by Loren Hope, and rose quartz earrings by Kendra Scott. I thought all the jewelry was super fab, particularly the bib, and I had a lot of fun finding outfits to wear with them. As for purchasing any of them? I wasn’t totally 100% in love with any of the items and even with the discount that Shine Insider’s get, it’s still kinda expensive. The Loren Hope bracelet retails for $78, but the discount only saves you $8. I think that the quality of the jewelry is top notch compared to some of the stuff I have from Claire’s and whatnot, so if you’re into investing in pieces this might be the perfect subscription box service for you. It’s perfect even if you just want to try things on for the fun of it! I’m trying Rocksbox out for the latter, because who doesn’t to love to play dress-up? 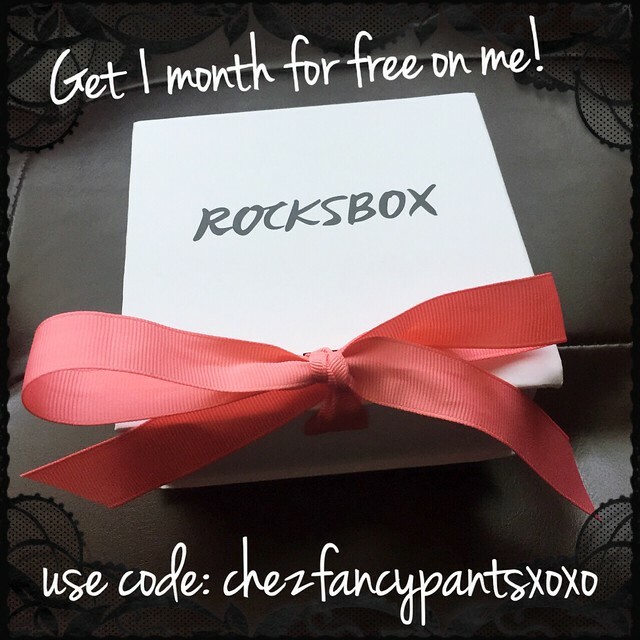 Don’t forget, using the code CHEZFANCYPANTSXOXO will get you a whole month of Rocksbox for free! FTC Disclosure: This is a sponsored post as Rocksbox has gifted me with a 3 month subscription in exchange for spreading the word about their company. All opinions expressed are honest and my own.